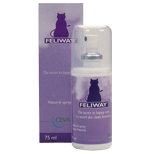 Feliway® is a synthetic copy of the feline facial pheromone, used by cats to mark their territory as safe and secure. By mimicking the cat’s natural facial pheromones, Feliway® creates a state of familiarity and security in the cat's local environment. As a result, Feliway® can be used to help comfort and reassure cats while they cope with a challenging situation and help prevent or reduce the stress caused by a change in their environment. The development of Feliway®created a new field in veterinary medicine: Pheromonatherapy. Pheromonatherapy (or pheromonotherapy, depending on the authors), is a new way to manage behaviour problems in animals. It is an innovative and natural solution to stress related problems in cats and dogs. Pheromones are 'chemical signals' used to communicate between members of the same species. As a result pheromones emitted by one individual can affect and change the behaviour of other individuals of the same species. How does an animal detect pheromones in the environment? Pheromones are secreted into the air by one animal and detected by a specific organ situated in the upper palate. To detect the pheromones, animals pump air into the vomeronasal organ. This ”pumping” behaviour is called “flehmen”. Depending on the species, the flehmen can be very discreet (as in cats) or quite obvious (as seen in horses and sheep). On detection, the pheromone induces a subconscious behaviour change. 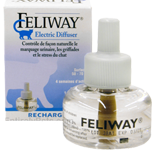 Feliway is available in 2 convenient forms: an electric diffuser and a spray.